9-month-old babies are developing at a rapid rate, so it’s important to choose toys to keep them interested and stimulated. There are so many different toys aimed at babies this age, it can be difficult to know what to choose. Here, we have outlined some of the things you should think about when looking for a new toy for your baby, to help you make the best choice. We have picked some of the best baby toys, in a variety of different styles, and shown their key features, to help you pick something which is sure to delight and entertain your baby. When shopping for toys for a 9-month-old baby, look for something which offers developmental benefits. You should also think about how long the toy will keep your child entertained. Babies have a longer attention span at this age, so look for something which will catch their attention and keep them entertained. It is important to consider safety when looking at toys for babies. Make sure there are no small parts which could be dangerous and ensure that any paint used is safe if your baby decides to chew on it. Think about the type of toy you are looking for to start you off in the right direction. 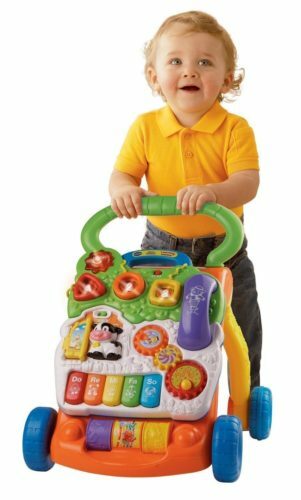 We have included bigger toys such as baby walkers and activity stations, as well as smaller toys for those looking for something to take in the car or stroller. There are also more traditional wooden toys as well as those with lights and sounds, so you are sure to find what you are looking for here. This educational toy offers so many developmental benefits to babies and toddlers. There is a huge range of activities of 5 sides of the cube to ensure your little one won’t get bored, and they will enjoy the toy up until the age of 3. Your baby will learn about the letters of the alphabet with the included building blocks, and parents will love how neatly the blocks can be stored in the cube. The toy can even be used for on-the-go fun, with the removable phone and keypad. This help teaches your child about numbers and counting. There are also activities on this cube to help develop your baby’s fine motor skills and problem-solving abilities. Parents will love the fact that this educational toy takes only 2 AA batteries. This classic learning to walk toy is perfect for babies aged around 9 months and above. It offers loads of benefits for your developing baby, mainly aiding them with their steps. The walker is very stable and strong, making it great for supporting them when they are just beginning to walk. The toy comes in different colors to suit your baby boy or girl. Babies who are not ready to stand or walk yet will love using the detachable panel to hear the sounds and see the lights. 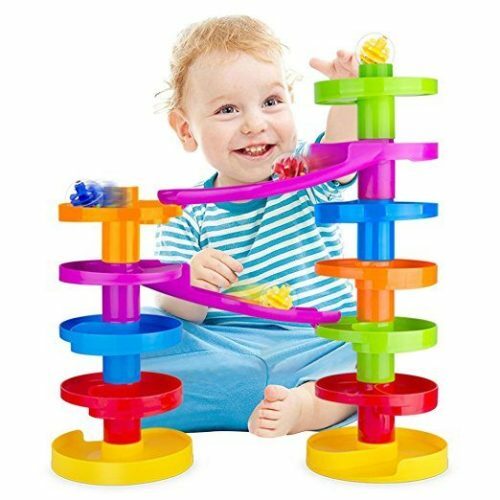 There are loads of fun buttons and activities to keep babies of all ages and abilities amused with this toy. 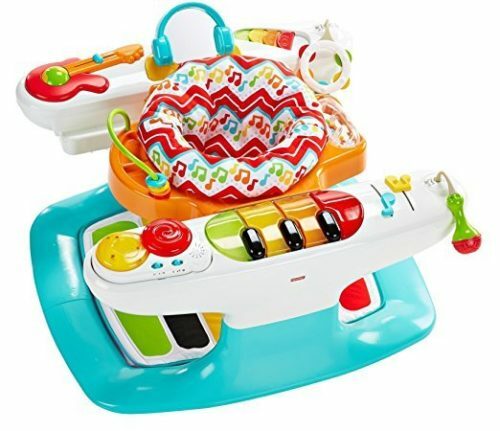 Over 70 sounds and effects are played by this toy, to keep your baby entertained over and over again. These soft car toys are sure to be a hit with young boys and girls who love anything that ‘goes’! They are perfect for babies who are able to crawl – babies will love to chases the pull-back-and-go vehicles. The cars are soft and light, making them easy for young babies to pull and roll by themselves. The soft bodies mean they can be safely chewed on, and your baby won’t hurt themselves if they drop the toys. 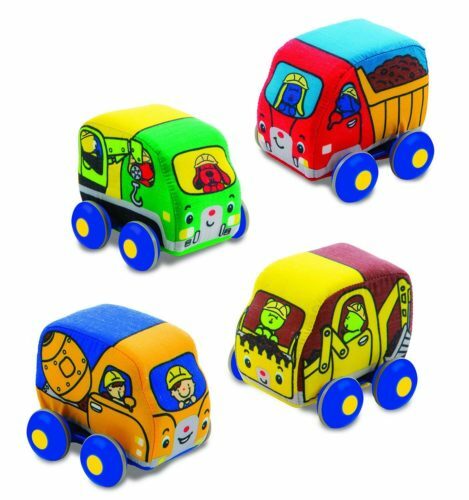 The set of 4 vehicles is great for keeping babies’ attention thanks to the different designs and bright, bold colors. They are perfect for encouraging imaginative play. Even older babies and toddlers will love to play with the soft cars and act out construction scenes. This excellent-value step & piano play toy offers a huge range of different uses for growing babies. Babies can use this toy right from birth, and it will last into the toddler years. When your baby is very young, they can use this as a play mat on the floor, which is excellent for ‘tummy time’. This is a great way to strengthen the muscles in the neck and back and will help you, baby, be able to hold their head up and eventually sit up. Once your baby is able to hold their head up well, they are ready for the next stage of this Fisher-Price toy. They can sit in the seat and play with their hands, whilst also jumping and stamping on the mat to make fun music with their feet. This is a really good way to get your baby active and moving – they are rewarded for the efforts with interesting sounds, which encourages them to keep going. Once your baby is able to walk, they can no longer use the seat. But this leaves you with an activity table for them to stand and play with. 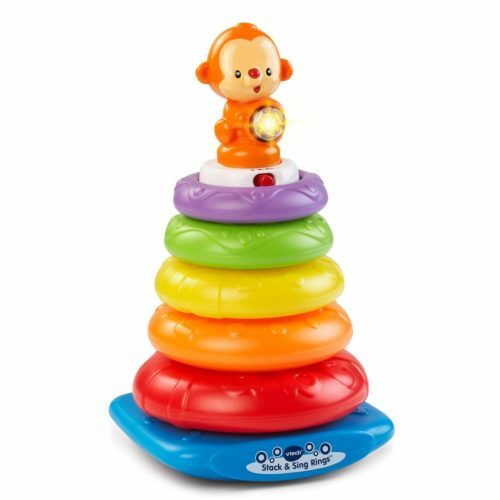 Older babies will love the educational songs and sounds – this toy will keep your baby interested from birth for a few years making it excellent value for money. This ball drop toy is ideal for entertaining older babies and toddlers, making it the perfect choice for your 9 month old. Young babies will love to watch where the balls are going after parents have built up the tower. They will love helping, and when they are able to reach, putting the balls in the top will be great fun! Older babies will love building the towers by themselves, and this is a great way to encourage creativity and problem solving skills. The toy can also be used to teach baby all about different colors, thanks to the bold and bright pieces. Each section is made from strong, sturdy plastic which makes it perfect for young babies to chew on and throw around. This cute, cuddly pelican toy is great for developing your baby’s senses and improving their motor skills. The mouth opens and your baby can drop the squeaky, rattling sea creatures inside to ‘feed’ the pelican. This toy is great for babies around 9 months old, who are just gaining the ability to put objects inside a container and take them out again. Your baby will delight in feeding the pelican and emptying the fish out over and over again. The toy is also ideal for sensory development. Young babies will love the different sounds and textures of the sea creatures. The bird also has lots of different textures for your child to find and explore. Your child will love to engage in imaginative play with this Melissa & Doug toy, too. This classic baby toy is great for your 9 months old’s development. Babies will love to try and stack the rings onto the center pole, and they will be rewarded with fun music and sounds when they succeed. In fact, there are over 40 songs and phrases included, to keep your baby motivated. The base wobbles to make the challenge a bit trickier, as well as more fun! The colors are great for teaching your baby their names. The monkey on top is also great for keeping your baby interested and keen to try again. The rings are the perfect size for little hands to hold and grasp. They are also ideal for teething – they are durable enough to handle some throwing and chewing! An activity table toy is a great pick for a 9-month-old baby. They can be used without the legs for babies who are able to sit but can’t yet stand. Once your baby is able to stand, they can use the table with the legs on. The table has so many interesting activities on it, your baby will be motivated to stand up and strengthen their muscles. There is so much your baby will learn through playing with this toy. There are over 70 songs and responses, and lots of bright colorful lights to entertain your baby. The toy also plays traditional nursery rhymes your child is sure to know and love. Babies can also learn about numbers, shapes, colors, and letters using this fun and educational toy. 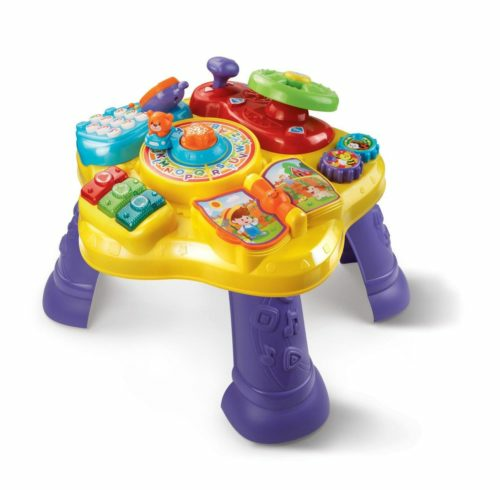 The VTech activity table is great for older babies and young toddlers. It offers activities in English and Spanish, so it’s great for bilingual households, or for those who want to get their child used to another language at an early age. Babies will enjoy listening to the nursery rhymes the toy plays. The toy provides opportunities for imaginative play too. There is a phone which your baby can use to call different animals. There is also a steering wheel which can be used to make the bear go around the center of the table. This is a great way to help develop your baby’s hand-eye coordination and motor skills. The learning table is great for teaching your child early reading skills with the interactive songbook. They will learn how to turn the pages of the book to hear the different songs. Overall, this is a great value toy with plenty of educational opportunities for babies aged 9 months and over. 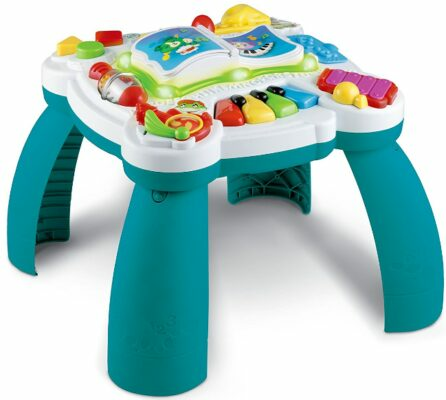 The Learn & Groove Activity Table is a great toy for baby boys and girls. It offers a huge range of activities for babies from birth right up to toddlers, making it excellent value for money. Young children will love playing their own music with their hands and feet. There are also great learning opportunities with this toy, so you can ensure your child will be taking in new information all the time when they are playing. This is a fantastic toy for getting your baby moving around and using up some energy, whilst strengthening their muscles and having great fun at the same time. If you are looking for a cheaper toy for your 9-month-old baby, VTech’s walker is a great choice. It is great for helping your baby take their first steps, providing encouraging sounds as they go. 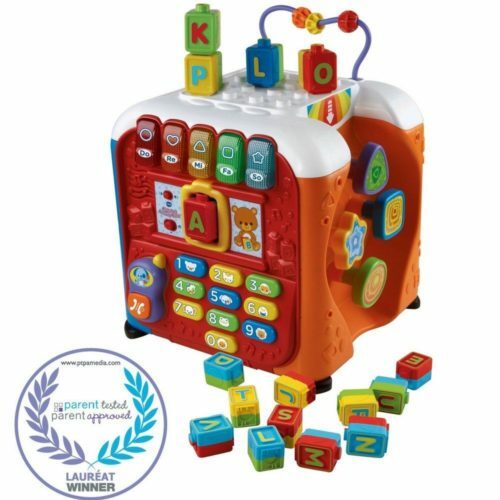 The detachable activity panel is perfect for amusing younger babies too, who can sit on the floor and play with the buttons and phone whilst enjoying the colorful lights.